"With so many amateur intelligence experts clouding the public dialogue, it is a pleasure to read the work of an author of real professionalism. Timmerman adds texture and clarity to the gross failures of our intelligence establishment, and new visibility to the role of Iran in the Islamist war against America. " 50 pages of exclusive documents and photos, including of Iran's chief terrorist, Imad Mugniyeh. From the Prologue: What If the Ayatollah Got the Bomb? In a cleft between two mountains around fifty kilometers southwest of Natanz, Iran’s Revolutionary Guards have constructed a deep underground facility using special tunneling machines imported from Germany. The blast door giving access to the buried facility measures eighteen meters across and nearly six meters high. Its surface has been faced with natural rock, making it virtually invisible to outside eyes. It opens onto a well-lit tunnel nearly sixty meters long that leads to an underground traffic circle wide enough for an eighteen-wheel tractor-trailer to turn around without hindrance. From the circle, six tunnels lead down to separate underground chambers. Two of the hardened storage bunkers house Shahab-3 missiles, each with its own Mercedes-Benz tractor and specially designed launch trailer. The Revolutionary Guards claim that the missiles can be driven outside, fueled, and launched within twenty-five minutes, and that they can then scoot underground before any retaliatory strike. In nearly a dozen live tests, they have shown that the missiles can hit targets anywhere in Israel. New versions will soon be capable of hitting America directly. 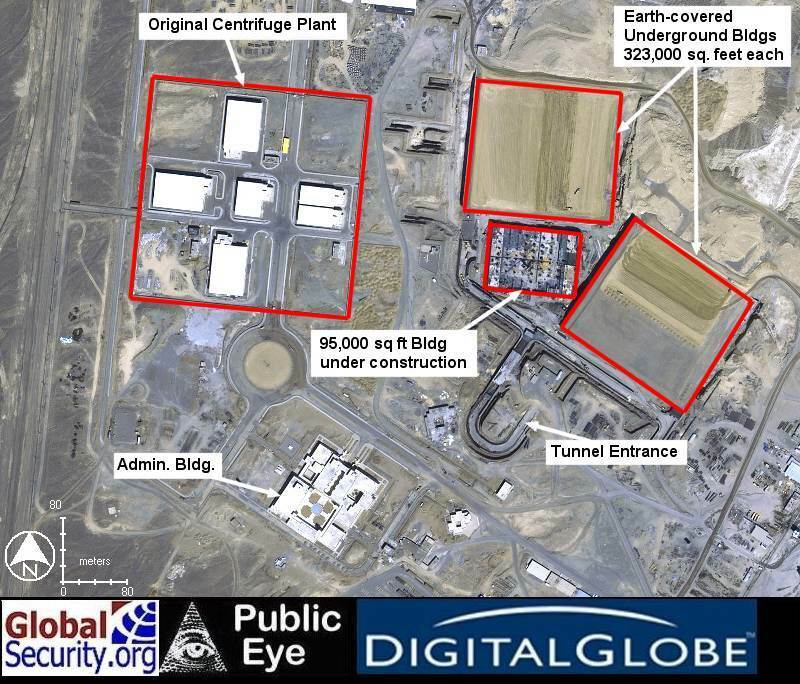 Two of the storage depots house a secret cascade of uranium-enrichment centrifuges— high-speed spinning machines designed to convert uranium into fuel for nuclear weapons. This is one of several such cascades now operating in Iran. The other two underground chambers house fifteen nuclear warheads ready to be mated to the missiles. ... What if the Ayatollah got the bomb? For years, this was a rhetorical question. Today, it is a reality for which Americans must prepare. "Utilizing contacts with dozens of Iranian defectors and officials, previously classified documents, and high-level sources throughout the government and intelligence community, The New York Times best-selling author pulls the Persian rug out from the Iranian clerics who have been mobilizing to kill during four U.S. presidential administrations. 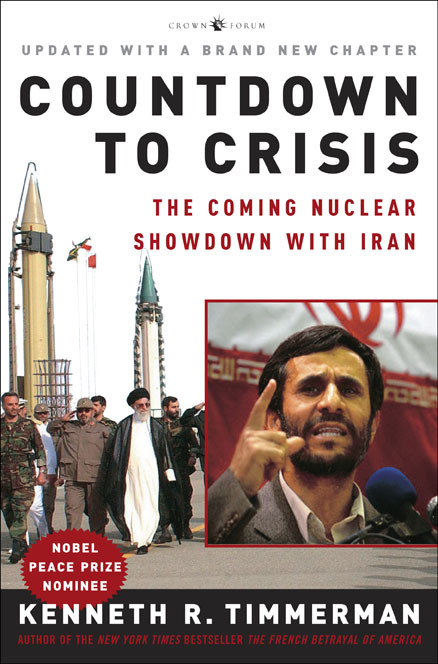 Readers alarmed by Iranian President Mahmoud Ahmadinejad's recent call for the annihilation of Israel will take no comfort in Timmerman's electrifying book." “In meticulous detail, Timmerman chronicles the myriad ways by which the Iranian regime has sought to acquire an offensive atomic capability over the past two decades...But Timmerman's most striking claim has nothing to do with Iran's nuclear program. Building on accounts stitched together from interviews of multiple Iranian defectors and foreign intelligence investigations, he levels a blockbuster accusation: that Iran played a key role in the planning, organization and facilitation of the 9/11 attacks." "Ken Timmerman’s book, Countdown to Crisis, should be required reading for all the neo Neville Chamberlains at the State Department, National Security Council, or elsewhere in the Bush Administration..."
"Mr. Timmerman marshals an impressive amount of evidence suggesting Iran may have known about the attacks and has given sanctuary to senior al Qaeda officials who were involved in planning them. Perhaps most disturbing of all is the information he presents suggesting that the CIA and other U.S. intelligence agencies have systematically tried to whitewash credible evidence from Iranian defectors linking Tehran and al Qaeda before and after September 11." "There are villains enough to go around. Vacillating presidents. A CIA that dismisses any intelligence that does not square with its analytical model for Iran. Cold, greedy Western powers who never met a mullah they couldn't do business with. There are cover-ups and blunders galore. But it is the conclusion reached by this well-written, thoroughly documented book with 50 pages of supporting material that will put a chill on all those cheery news reports about democracy in action in Iran. There is something bad coming our way." –James Srodes, author of "Allen Dulles, Master of Spies" and other biographies. "I came to love Ken Timmerman's book, Countdown to Crisis. He tells us the insurgency is all in Iran. They start every meeting with "Death to America, death to Israel," and everyday they try and make both things happen. From Beirut to the Khobar Towers, and now in Iraq, they have been killing our people. I wonder how much longer we will take it and when we will prove UBL is in their country.